Take the Side Street: It Goes Up To Eleven! It Goes Up To Eleven! Ever heard of Mandi at Vintage Revivals? If not, now you have! And I doubt you'll forget her anytime soon. Like this post's title tries to imply in a nerdy Spinal Tap referencing way, this girl is creative. It goes up to an eleven, people. She just made the crazieaziest project ever. As in, I'm in awe at both the product and the process. 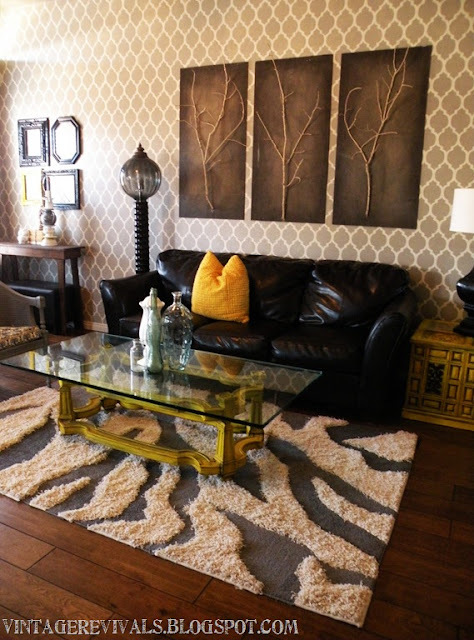 Mandi wanted a zebra rug -- you know, the ones that are popping up in cute rooms right now. She didn't want to pay hundreds of dollars though, so girlfriend made.her.own.rug. I couldn't make this stuff up. Please, hop over to Vintage Revivals and read about this amazing project.